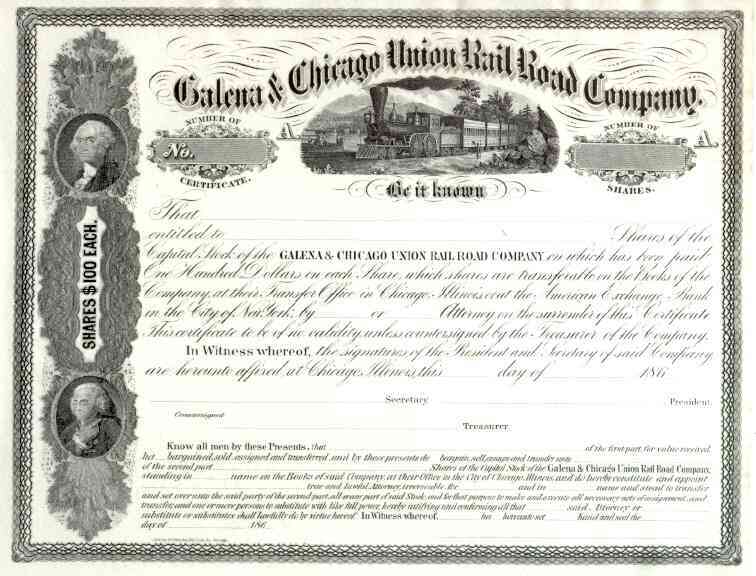 186_ Galena & Chicago Union RR Stock Certificate. Attractive early railroad scripophily certificate with vignettes of steam train, Washington, and Franklin. The Galena & Chicago Union was chartered 1836 to connect Chicago with the lead mines at Galena. It was the first railroad constructed out of Chicago, but never reached as far as Galena. In 1862 it was leased in perpetuity to the Cedar Rapids & Missouri Railroad which eventually was first railroad to reach Council Bluffs, Iowa. The Galena & Chicago Union consolidated with the Chicago and North Western Railway in 1864. VF+ condition.